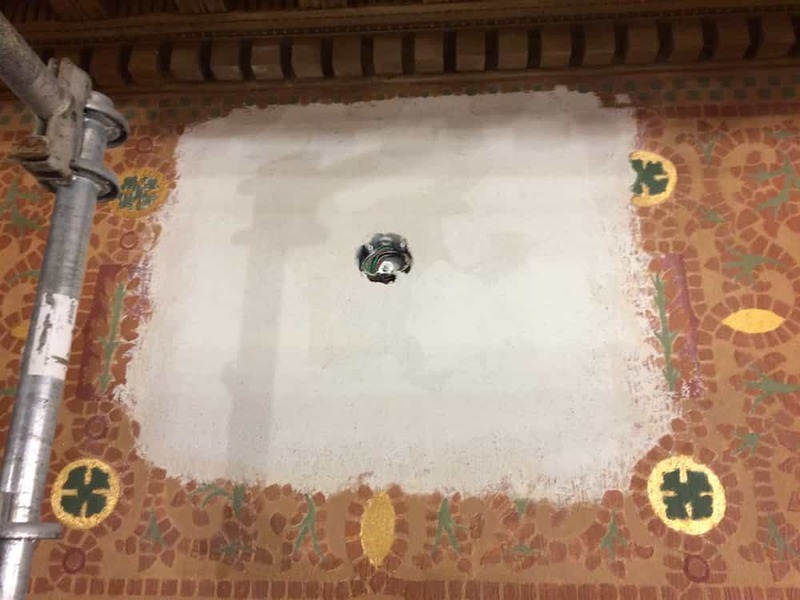 Simulating Mosaic in a Boston Landmark | John Canning & Co. The First Church of Christ, Scientist is the largest privately owned but publicly accessible space in Boston. 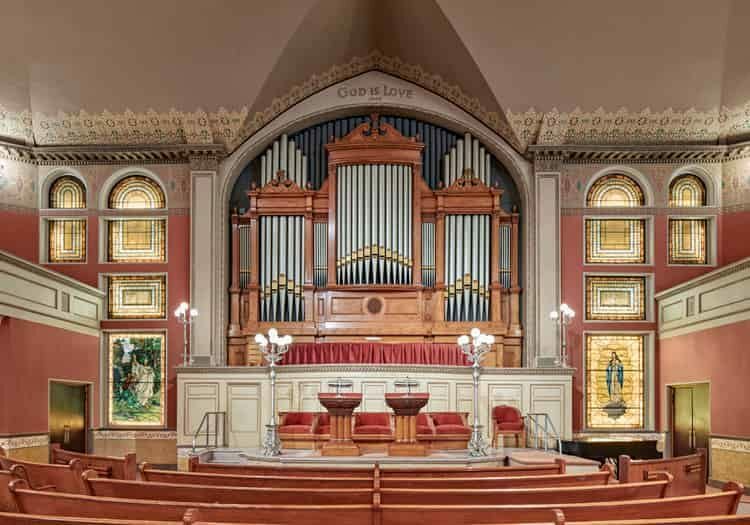 Designed in the Romanesque Revival style, the Mother Church was constructed in 1894. 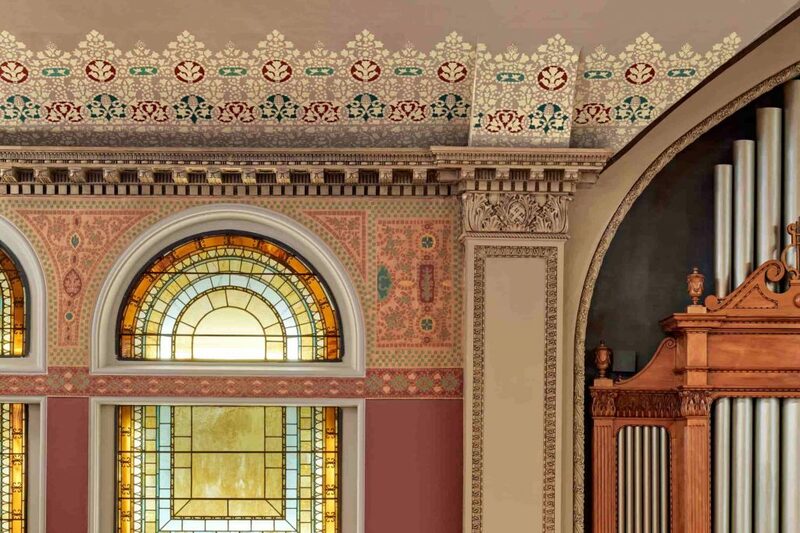 Part two of a seven-phase project led by Finegold Alexander Architects and Shawmut Design and Construction, the project was one of a modernization that included mechanical upgrades while preserving the original materials including the simulated mosaic frieze and ceiling borders which directly relate to the mosaic wainscoting at the lower level. 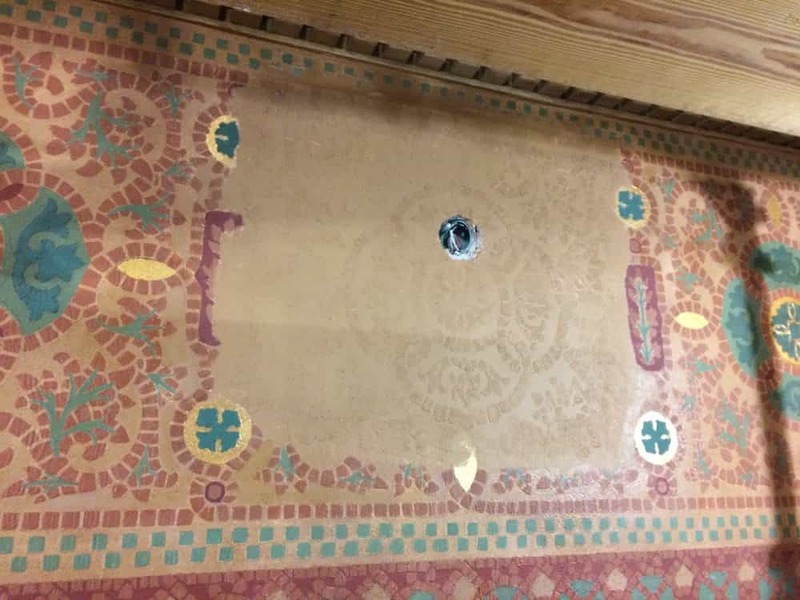 John Canning & Co. was tasked to restore the simulated mosaic while conserving the surrounding original decoration. The stenciling throughout was carefully documented and each color custom matched. To replicate the simulated mosaic required a multi-step process. 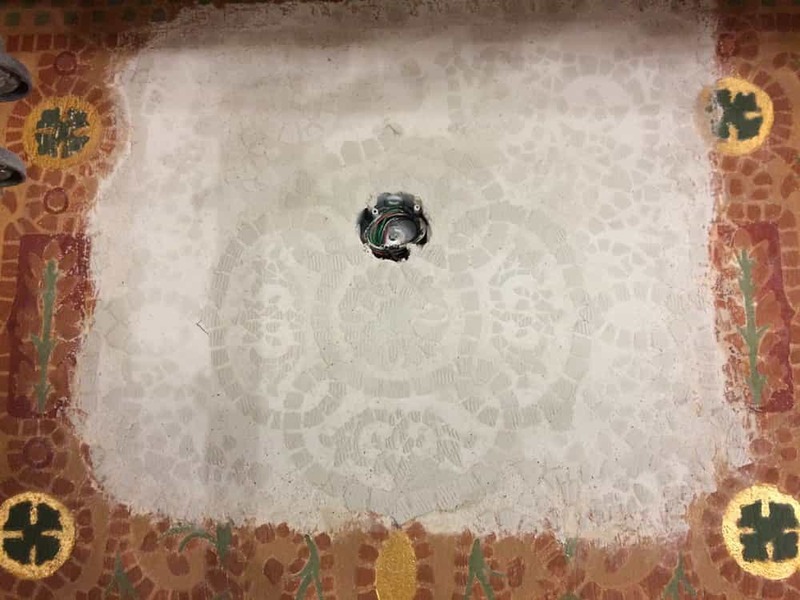 Prior to painting, the plaster was built up and layered to simulate tesserae. 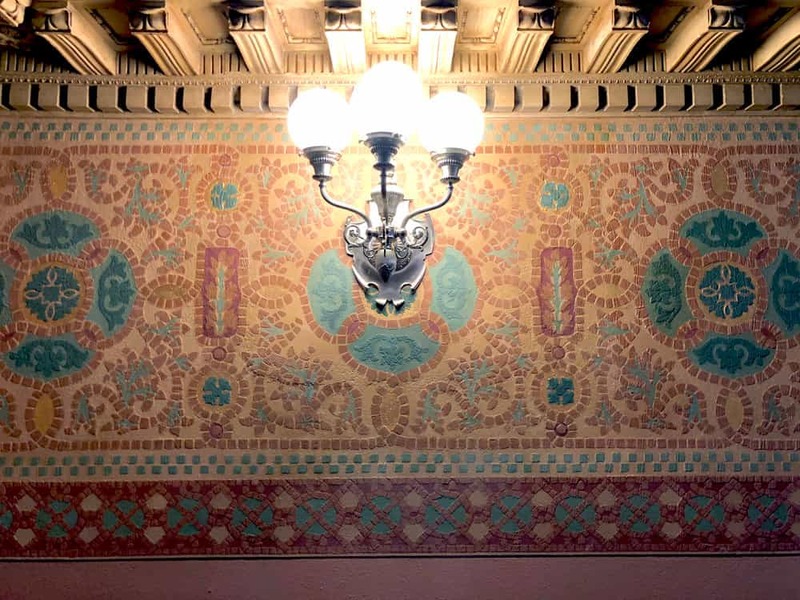 The simulated mosaic stenciling at the upper walls included as many as 8 separate colors. 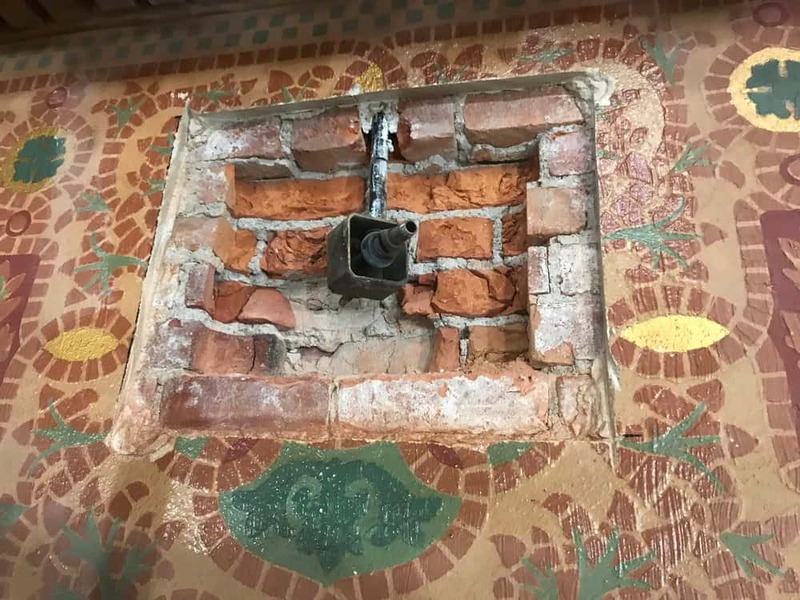 Where channels were cut in the historic plaster for modernization’s, the decorative paint was seamlessly replicated to match the surrounding historic in texture, color, and sheen. The mosaic treatment at the ceiling was replicated in its entirety. 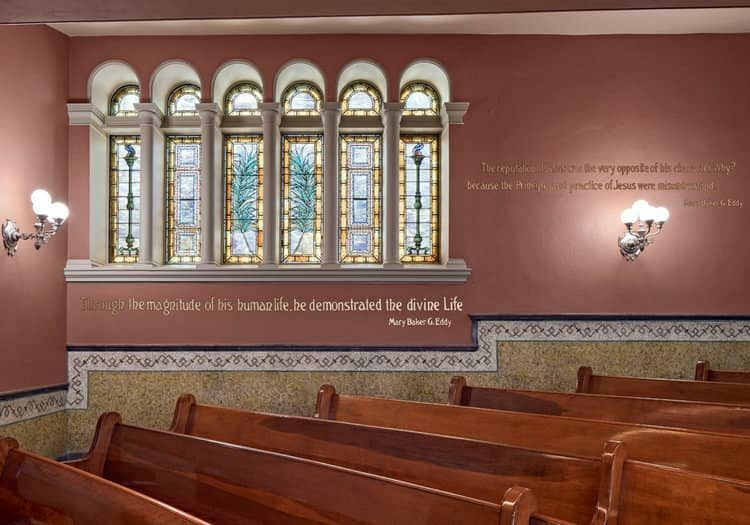 Gilded quotations, including “God is Love” by Mary Baker Eddy, adorn the walls of the church. Each quote and gilded letter was originally hand drawn over the coarse plaster walls. The characteristic of each individual letter was documented and replicated using traditional 23K gold leaf and outlined in a deep maroon color to punctuate the brilliance of the leaf. “Fervent Heart, Willing Hands,” Mary Baker Eddy believed in the power of healing. As craftsmen, the restoration of the original decoration strove to heal and preserve the historic finishes for future generations to come. 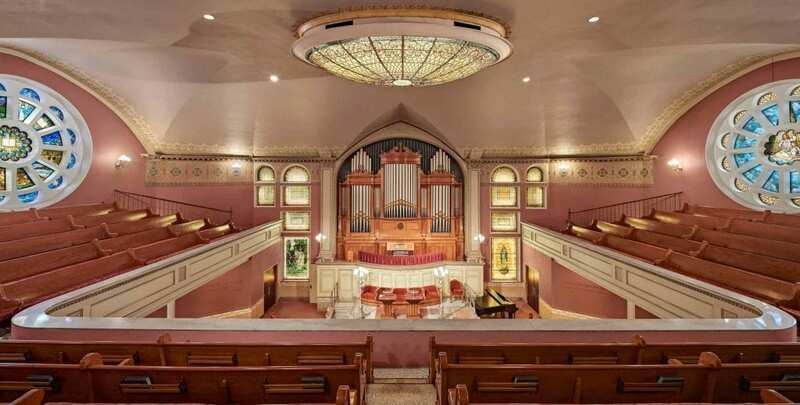 Learn more about the project at the National Trust for Historic Preservation website.